Same drug act in different ways based on the route of administration. Different routes as nasal roeute, oral route, vaginal route, urethral route and rectal route are used for the administration of the drugs in Panchakarma. Action of drug is well described in the different compendium and the clinical efficacy of Panchakarma is well explained and practiced thoroughly, but the mechanism of the action of Ayurvedic drug is till unexplored in modern perspective. The mechanism of action of therapy as mentioned in Samhita is scientific if analysed in modern purview considering the Physiology, Anatomy, bio-chemistry etc. 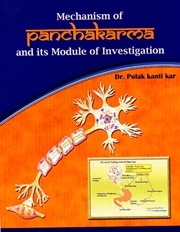 An attempt has been made in this book to establish the hypothetical mode of action of the therapy in Panchakarma for better understanding with scientific entity keeping the principle intact. This book will be beneficial for the students, teachers and professional who are always keen to know the hidden truth of Panchakarma. Dr. Pulak Kanti Kar did his graduation from University of Calcutta, Post graduation in Panchakarma from Gujarat Ayureved University and Ph. D from Rahasthan Ayureved University. He has successfully performed thousands of Panchakarma in different critical diseases. He has written six valuable books on different aspects of Panchakarma. His approach & motivation to propagate Panchakarma has inclined several students & practitioners of Ayurveda to perform this therapy in clinical practice.